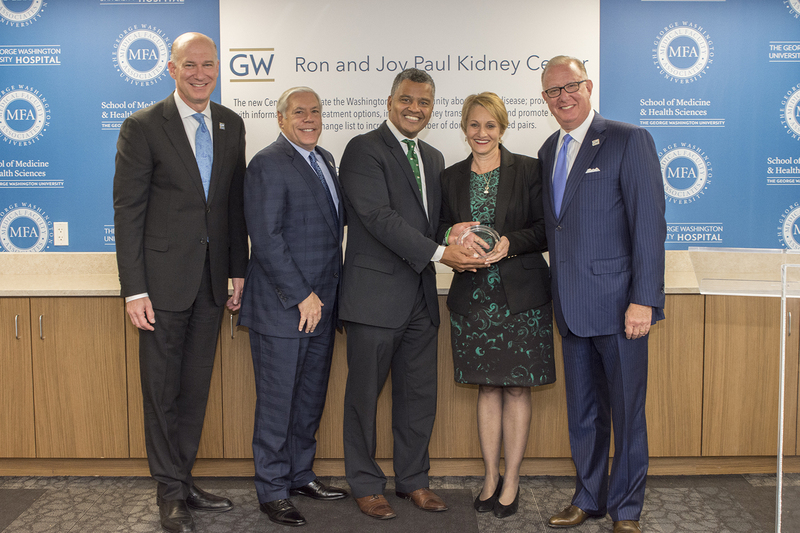 News » GW Ron & Joy Paul Kidney Center to Increase Live Kidney Donation in D.C. The newly launched Ron & Joy Paul Kidney Center at GW will raise awareness about kidney disease and increase live kidney donation in Washington, D.C. Thanks to a $2.5 million gift from The Ron & Joy Paul Family Foundation, established by Ron Paul, chairman and co-founder of EagleBank, and founder of Ronald Paul Companies, a real estate development company, and his wife, Joy, a social worker in private practice, the Center will launch several initiatives aimed at addressing the burden of kidney disease on D.C. citizens. The need for kidney donation in the U.S. is urgent — 12 people die each day while waiting for a life-saving kidney transplant. Nearly 80 percent of those waiting for a kidney transplant in the District are ethnic minorities. In D.C., kidney transplants have decreased, but the incidence of end-stage renal disease has increased. The Ron and Joy Paul Kidney Center hopes to remedy this situation and increase the number of live kidney donation in the D.C. metro area. Additionally, the Ron & Joy Paul Kidney Center will support the establishment of educational forums, including a Kidney Transplant Education Series and educational outreach programs at community clinics and faith-based organizations. The Center will also support and bolster the efforts of the Minority Organ Tissue and Transplant Education Program (MOTTEP), which partners with the GW Transplant Institute to address and reduce the number of ethnic minorities in need of transplants. MOTTEP initiatives include promoting paired kidney exchange lists. GW Hospital performed its first paired kidney exchange earlier this year and anticipates many more to come. Kidneys donated from living donors offer better outcomes and can shorten the long, health-threatening, and uncertain wait for a kidney. Kidney disease awareness is crucial for keeping future generations off the kidney transplant list. Many patients miss the early warning signs of kidney disease — high blood pressure, frequent urination, and creatinine in the blood, among others. The later the diagnosis, the more difficult it is to remain healthy enough to receive a kidney while on the transplant list. To learn more about the Ron and Joy Paul Kidney Center at GW, visit smhs.gwu.edu/kidney. To make an appointment at the GW Transplant Institute, please call 202-715-4225. The George Washington University Hospital is a 385-bed tertiary care, academic medical center located in downtown Washington, D.C. Featuring a Level I Trauma Center and a Level III NICU, GW Hospital offers clinical expertise in a variety of areas including cardiac, cancer, neurosciences, women’s health, and advanced surgery including robotic and minimally invasive surgery. The mission of the George Washington University Hospital is to provide high-quality health care, advanced medical technology and world-class service to its patients in an academic medical center dedicated to education and research. GW Hospital is jointly owned and operated by George Washington University and a subsidiary of Universal Health Services, Inc. (UHS).